​ "Latin is different." If you teach Latin, you've heard this phrase or even used it yourself hundreds of times. The phrase offers some protection from the over-standardization of education. It's the reason that I don't have to be on the "Food Chapter" at the same time as my modern language colleagues or tediously plot out the questions on the final exam. For some, it's fighting words - as in "Latin is NOT a real language." Then there is the Latin is NOT different movement - it can and should be taught like any modern language. And there is some truth to this as well. But still, Latin is different - perhaps not linguistically but our subject is different nonetheless. The Spanish teachers in my school tell me that their curriculum is "All About Me" in which students discuss what they like to eat, what they like to wear, what sports they like to play etc. I see the appeal. But as a seventh grader, I didn't play sports. My clothes were second-hand, and I didn't want to talk about things I might say at a party since it seemed fairly unlikely that I was ever going to go to one. I was much more comfortable with topics "Not About Me" - monsters, heroes, and powerful people making terrible decisions, battles won and lost. I wanted a vocabulary for my imagination, not a vocabulary for a TV version of my life. My students seem to want the same. The fact that our beginning vocabulary consists mainly of weapons and farm animals delights them. They ask me questions about gods and monsters. They tell me about the comic book, video game or fantasy novel heroes and heroines they admire. They are escaping too- perhaps not for the same reasons, but I understand the need and I am glad to supply the outlet. Next week, the Spanish class is moving onto "clothing." We will a read a version of Mucius Scaevola and act it out. There will undoubtedly be debate regarding who gets to stick their hand defiantly in the yellow and red tissue "fire." Latin is different. I am glad. 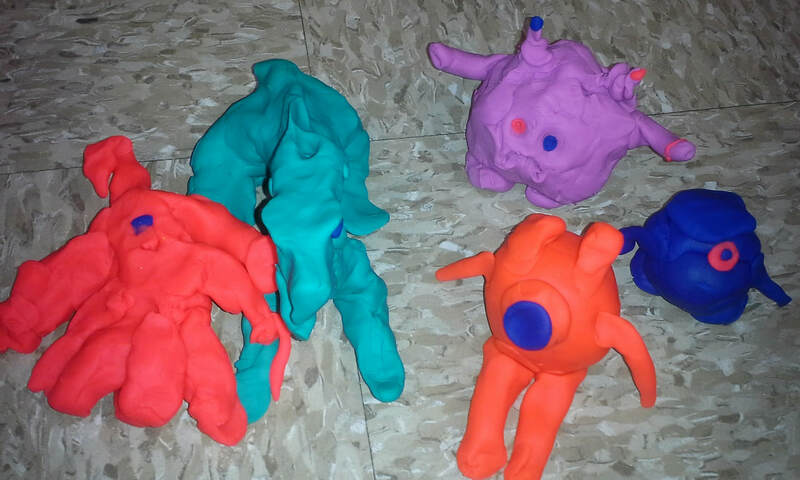 Play-doh monsters created for our winter break "arena." Working in teams, students moved their creations from tile to tile, answering questions, pulling off each others arms and eventually smushing each other based upon a set of overly complicated rules. This game needs some tweaking before it makes it to the blog. I see it - just before dawn – the dark beast, stark against the bright beach. I hear the grunting and thrash of sand as it lurches forward. Once or twice, I feel the terrible rumbling of its belly as it rocks back and forth. I won’t watch. Instead, I slip out of the palace, and sit on the cool marble steps of my temple. I turn around. It is Maya, my youngest sister. “Mama said I would find you here. Why are you here all by yourself? As she blinks up at me, I’m at loss at what to say. I notice the flowers clenched in her small fist. I pat the step of the temple below me. She smiles, skips up the stone steps and settles herself in front of me. I tuck the flowers in her hair while she prattles on about the evening’s celebration. She’s very excited – lots of gestures and I have to remind her to stop bouncing so much so that I can properly braid her hair. I can’t hear what she’s saying because he is whispering in my ear again. His tone has lost its’ teasing quality and has become more urgent. “Come with me,” he breathes. I feel his fingers brush my cheek. I look up and he is gone. By order, I mean the order of grammatical concepts taught. Some ordering promotes confusing and repeated explanation of the same topic and others promote understanding and continued interest. And by matters, I mean matters to your average or less than average student. It doesn't matter to your superstars. In fact very little of what you do as a teacher matters to a student who is both brilliant and independently motivated. If these kinds of students make up your class, then click off this blog and look at something else. If however, you have a fair number of students who came to Latin via interest in video game monsters, Percy Jackson, or simply not getting into the Spanish class of their choice, then read on. If you are feeding into a four year program with other teachers, the textbook dictates the vocabulary and concepts you need to cover as well as the emphasis of certain concepts but it does not dictate the order in which you approach those concepts. In most cases, it is not necessary to shred the textbook (a la Robin Williams in Dead Pet's Society) but instead do as Tim Gunn in Project Runway advises, "Use the fabric judiciously and make it work." Below are some strategies how to do this. The best way to explain anything is to relate the new idea to something they already understand. In the complicated structure that is Latin grammar, case and declension are poor ways to start. English has neither. Nearly all textbooks begin either by listing cases or declensions. The concept that everyone understands is gender. All humans are accustomed to making decisions about gender based upon certain easily visible characteristics. I tell students that we can make decisions about the gender of nouns the same way we make decisions about the gender of people - by looking at the characteristics. Here of course there are always jokes about how "Sometimes you can't tell" and "What about transsexuals, people who change gender" etc. I explain that similarly with Latin nouns, you can make errors about gender, but many times, you can tell immediately. Incidentally, this discussion can be a great segue into a productive conversation about tolerance. The point is though to tell students that Latin nouns have three genders rather than two, a difference they will find interesting and that these genders can easily be identified by their ending. Here I teach them the nominative of first and second declension nouns - masculine, feminine and neuter. I usually begin with puella, servus and scutum. I never mention the word declension or nominative in this discussion. I tell them that feminine words end in a, masculine words end in us or r and neuter words end in um. In over 20 years of teaching, I have never met a student who did not immediately understand this concept. If your textbook begins by listing all the case endings of the first declension, ignore it and use the exercises in the first chapter of your textbook. In general, the first chapter exercises in these books only use short sentences with the nominative case. You may need to write some auxiliary exercises with masculine and neuter nouns but since these sentences will be very simple, this shouldn't present too much of a problem. If your textbook begins by explaining declension, read the stories anyway. Point out the masculine, feminine and neuter nouns. You may need to add a few neuter nouns in sentences. Several popular textbooks begins by explaining that there are three declensions that have two genders that can be identified by looking at the ending except when the can't - (a concept clear as mud to the beginning Latin student.) Ignoring this information initially will not be an issue because STUDENTS DON'T READ THE TEXTBOOK. Unless of course it is about mythology or gladiators - then they may read some. But I'm using spoken Latin and we need to use many words that are not first and second declension to communicate! Also doesn't matter - Students can and should speak and read many different phrases, clauses and sentences without being cognizant of the grammar. Understanding grammar is a piece of learning a language but it should not the sum total of the experience. Students can both hear and orally understand a great many words than they can grammatically parse. For example, my middle schoolers are very big on "volo" and "nolo." They find the words hilarious and they have learned to say volo dormire, nolo sedere, and a few other phrases. They are volo-ing all over the place. They have no idea that volo, velle is an irregular verb or even that the "o" denotes a first person speaker. They will - but their incomplete understanding of the grammar has not hindered their willingness to speak phrases they understand. From here, it is natural to discuss how to make all three genders plural. Here I mean plural nominative but I haven't actually mentioned that word yet. Again, when discussing that neuter words become plural by changing the "um" to an "a," it is useful to relate this change to the idea of gender that they understand. I ask students, if Brian puts on a dress does he become a girl? Similarly, when a noun changes it's ending, it doesn't change it's gender. The next step is to explain that adjectives match the nouns which means that adjectives take the same ending as the nouns except in the case when a masculine noun ends in "r" because the masculine adjective will end in us. This again, will seem logical and interesting to nearly everyone. Here you may need to write some practice sentences or phrases so students can practice changing the ending of the noun to match masculine, feminine and neuter nouns singular and plural. This whole process takes about two weeks. During this time students generally read the first chapter of their textbook and maybe the first chapter of some other textbook that I photocopied. The Latin Insults activity under "Beginning Activities is a useful and entertaining exercise to practice this concept. Most beginning chapters contain fairly simple paragraphs heavy on the verbs est and sunt and with few direct objects. Often there are some prepositional phrases, but that doesn't present a problem. If your textbook has third declension nouns, just ignore any explanation about the endings. In the reading method, where frequently third declension nouns are explained early on, students can read a great deal more than they explicitly understand. Again, this isn't too much different from the order of most textbooks but grammar based books only tend to teach ablative with feminine first declension words. This is ridiculous. Teach ablative with second declension masculine and neuter words. Teach the ablative only in the context with prepositional phrases. I find it's easier if they learn all the ablative prepositions at once. They can all be sung in a song (See Songs and Videos). Have them speak, write, draw ablative prepositional phrases. Have them bracket them in the text. If your text has accusative prepositional phrases, don't despair - have the students bracket those so they don't confuse the endings with the direct object. If an especially precocious student asks why the nouns in some of the prepositional phrases don't have ablative endings, you can tell him or her that this will be illuminated later in the course. Praise them for noticing of course, since that rarely happens. Latin Clue is another good activity to teach prepositional phrases in the context of accusative and nominative. Take a Break and Go to Verbs. At this point, all my students know about verbs is that they end in "t" when they are singular and "nt" when they are plural. Now it is time to break out the rest of verb endings. There is a song under the "Songs and Videos" tab to help students memorize this. It is useful to teach students how to form both ARE and ERE - first and second conjugation at the same time. The human brain is comparative. Students should learn that a verb has a stem, a linking vowel and a personal ending. Some have "a" as a linking vowel and some have "e." It amazes me how many textbooks only tackle first conjugation. Learning both at the same time is easier. I also explain the concept of infinitives here too. Save third and fourth conjugation for later. Again, students can read and speak verbs of all conjugations but introduce how to form first and second together first. Mendax - is a great activity to help students learn personal endings of verbs. At this point, the students will have enough familiarity with the nominative that they are less likely to confuse it with the genitive. Teach both possessive and partitive at once. It's easy to explain that the genitive is translated by putting "of the" in front of the word or 's, whichever makes the most sense. Teach them words like numerus and copia so they can see how partitive works. Don't bother to name these uses. It's not helpful. Teach them how to use accusative prepositional phrases. Have them form both - ablative and accusative prepositional phrases. Here by teaching a new concept, you are "circling" on an old one - what prepositional phrases are and how they are used in a sentence. More circling - same concept- personal endings plus linking vowels but different linking vowels than first and second conjugation. See a nifty song under songs and videos for a way to get kids to remember which vowel goes with which conjugation. The last case - Most textbooks teach the dative case poorly. You may need to find some supplemental stories to make sure students have enough practice with this case. As a review for all the cases, have everyone play Unus. Put all the endings on the board for masculine and feminine. Explain that they have already seen many of these words before but now we are going to learn how endings work. Declension is a tricky idea for students. I always explain it as a club. First declension is the cheerleading club. Most of the people wearing the cheerleading uniform are feminine but there are a few males on the team. I ask them, "If I told you that Alex is on the cheerleading team, what would you assume about Alex?" The 2nd declension group with endings of us in the nominative are mostly male. It's a bit like the football team. If I told you Alex is on the football team, what gender would you assume that Alex is now?" In both cases, there is a small chance that you might be wrong. I explain that third declension is like Student Council, which traditionally is a mixed gender club. When I ask the question about Alex regarding Student Council, students agree that they would have to ask a clarifying question to determine what gender Alex is. Like Student Council, the "uniform" or set of endings for third declension includes both masculine and feminine endings and so you just have to memorize the genders. they find this point discouraging but understandable. At this juncture, the learning of third declension endings is usually accomplished pretty quickly since students are now intimately familiar with the use of the cases. It's easy to form, it's regular - it uses the 2nd principle part. Thankfully most books see the logic of this. The imperfect tense is most often the first tense introduced. Now it is necessary to watch, the world's most bizarre and compelling Latin video. Thank you, Abbi Holt! So many texts introduce the future much, much later. Again, it's a little more challenging than the imperfect but it uses the second principle part and the imperfect and the future are easy to use in stories together. I wrote two stories that uses both imperfect and future tense together. One is based on the Ecce Romani series. The other is a medieval fable. They are both in the drive linked to this page. Now Tackle the Perfect System. Again, your students can be reading perfect tense verbs in context long before they understand how to use them. For example, my students know that "Dixit" means he said and "dicit" means he says long before they know any principle parts. Students need to read, read, and read. Most texts especially those grammar based series such as Jenny's and Wheelock don't include nearly enough reading material. Ecce Romani and Cambridge have more reading material but students who only read one text become too reliant on the style of that text and easily flummoxed when given something different. Older textbooks have wonderful, politically incorrect stories to broaden students reading interest and ability. Find them on internet book stores, in the back of your book room, at tag sales sponsored by the various Latin organizations. Here are some of my favorites. Using Latin - Another great text similar to Our Latin Heritage. The first book also has many stories. Latin Via Ovid - I love this book. The author has done an excellent job of adapting Ovid's self-aware style of narration. The first time the narrator addresses the reader, the students will be confused but they will get the hang of it. This series gets fairly complex fairly soon. It is a great bridge for students who need a bit more practice with subjunctive, participles and some other mid-level concepts. 38 Stories: Wheelock Supplement: This little volume is still in print. It has mostly myths in increasing levels of difficulty. It references the grammar used before each story and lists vocabulary. Lively Latin: This small, out of print book has great stories that I have never seen anywhere else. There is a whole series about a romance during World War II that makes great use of participles and ablative absolutes. You're a new teacher and you're excited but you feel unprepared. (Everyone does in the beginning). However, you will make up in energy what you lack in experience. You will work very hard and care very much. That's an excellent short term plan; one that will get you through your first year- maybe. It was my plan as well. The problem with this plan is that it's unsustainable. I know - blasphemous, since giving 110% is supposed to be the norm in education. The fact is that if you operate this way, you will burn out quickly and leave education regretful that you just couldn't hack it. As much as you strive to be, you cannot be the sole generator of enthusiasm, energy, and entertainment in your class at least not for very long. Teaching, as no one tells you in teacher training, must be an energy continuum to be truly effective. You give out energy and enthusiasm. Your class radiates that back to you which then in turn you give back to them and so on. This is how the momentum of the class is carried forward. I understand how ridiculous this sounds. I know you face a sea of sullen faced, drowsy, disinterested teenagers trying to steal glances at their phones when they think you aren't looking. Here's the thing - no one has explained this concept to them either. Mostly, what teenagers understand about school is that if they remain as motionless and passive as possible, they are more likely to stay out of trouble and less likely to be embarrassed in front of their peers. So how can you create this energy that propels the class forward? You know that little lift you feel when someone compliments you? We know our students need praise. Hundreds of books and articles have been written about the power of praise in the classroom. But teachers need to hear it too. And I know, most likely, you haven't heard much, especially from students. Gratitude is a forgotten skill in the classroom. Teach it. It is important that if we do something in this class that you particularly enjoy or you found particularly helpful, that you tell me. Often times, I try a new game, a new approach and with no feedback from you, I wonder if it was worth it. Often times, I only know what worked in my class long after the class is over or when someone complains, "Why don't we do such- and-such anymore?' If you tell me what like and what worked right after we did it, it makes it much more likely that we will do it again. Besides, I'm human - I worked hard to make this activity fly and like everyone else, I need a compliment now and then as well. Sometimes, I find the opening to have this conversation when I hear another student talk about a different teacher. Here's a short replay of a conversation I had several years ago with an eighth grade class. Student 1 (to another student entering the room): You know, I think this is the first year that I understand math. Ms. Casey really explains things. Me: Did you tell Ms. Casey that? Me: It's important that you tell Ms Casey that. She's an excellent teacher, I know - but you would be surprised how little she hears about what she's doing right. I bet if you told her that, it would make her day. Student: Yeah, it probably would. Some kids are real jerks in that class. I cannot be the only person in this room standing for this class. If you are interested in learning and someone is interfering with that, I give you permission to call them on that. Tell them, "Shh" Or say, "You know, I really want to hear this!" Your voice is more powerful than mine. I am the teacher - that means I am always saying stuff like sit down, stop chatting etc. But when a student speaks up, that's powerful. This does not mean that you have permission to yell "Shut up" or call people names but there are ways to let your classmates know that you don't appreciate their interruptions. Nota bene: You are going to need to have these conversations more than once. That's okay - it takes time to shift the flow of energy from teacher to student to a circular flow. Consider the overall energy required from you as you plan your day. When I plan a lesson, I always ask, Who is doing all the work here?" if the answer is me - then I look for ways in which the students can participate more or that they can do most of the work in the following lesson. So much of this flies in the face of what is conventionally understood about what makes a great teacher. Our iconic teaching movies, Dangerous Minds, Stand and Deliver, and Dead Poet's Society focus on the charisma and wit of the individual teacher standing up in front of an often hostile class. This is an unsustainable fantasy. Even in the movie, Mr. Escalante, the calculus teacher in Stand and Deliver was hospitalized before he finished his first year. Ms Louanne Johnson, the inspiration for Dangerous Minds only taught high school for five years before moving onto college. And Dead Poet's Society? Seriously. Can you be Robin Williams for five shows a day? This does not mean that you should not stand up and command the attention of the class. You should - just not every day, every period. Stand in front of the class to explain instruction, stand in the back to allow students to absorb it. More time will be needed in the back than the front. The majority of your class should be spent with students doing something to practice, absorb, learn the concept you have taught. And this is good for two reasons. First of all, in order to survive a teaching career, you need time "off stage" to recharge your energy and students need to put forth energy to learn. Learn to vary your instruction - because it's good practice but also because it will save your sanity. Examine your day - do you have five periods of "Stand and Deliver?" If you do, reassess, create more student-centered activities for half your classes. Get yourself off stage or your final shows will be ragged and cranky. I know teachers are supposed to have unlimited energy and enthusiasm but let's be honest. No one does. While every teacher training program talks about the importance of varying your lessons to maximize your student's learning, it's also important for your own health and longevity in this career. The pool of available and interested Latin teachers is small. Myself and other veterans need new teachers to whom we can pass the torch. We are rooting for you: burn bright but not out!